The vCloud Director hierarchy will become available in the vCloud Director View. Note that it may take a while for Veeam ONE to collect and display data for the newly added vCloud Director and its child objects. When you connect vCloud Director, Veeam ONE also connects underlying vCenter Servers and initiates data import. vCenter Servers become available in the Infrastructure View, and you can work with them as with regular VMware vSphere infrastructure servers. 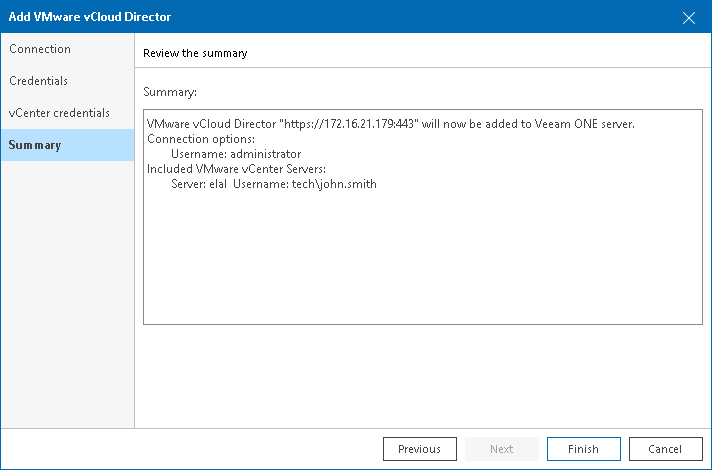 If the vCenter Server attached to vCloud Director is already connected, Veeam ONE will simply create an association between the vCloud Director hierarchy and the vCenter Server.